A couple of months ago, I became curious about these bad days. They had become more sporadic, but why? What was different on those days that made my usual therapy nearly ineffective? This is where I talk to you about a Pain Diary. 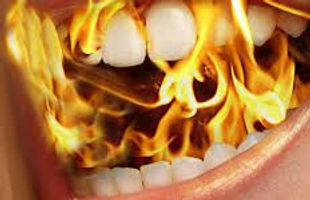 You may have kept one at some point in your Burning Mouth Syndrome or another chronic pain journey, but statistics say that most of us just don’t. I decided to give it a chance. You can set it up in an Excel spreadsheet or WORD document on your computer. You can do it on graph paper or in an actual diary. The important thing is to do it and do it consistently. This gives you a chance to correlate your pain to foods, hormonal cycles, and even timing of dosage on your meds. A Pain Diary will have 5-8 main columns (you can add more if you like) and include: Date / Time / Pain Level (1-10) / Medicine & Dosage Taken / Pain Level (1-10) 1 hr. later. I have included a pictorial pain assessment graph below. Remember, no one can endure a level 10 for any time without medical intervention, so think carefully and comparatively when you assign a number to your pain. Overstating the level makes doctors question whether we understand the concept, and you really, really want them to take you seriously as the intelligent and informed patient you are. You can add columns for foods eaten, the weather, the activity you were engaged in, or whatever additional variables you may suspect make a difference. I think making it very individual leads to more consistency in using it. I kept one for a few months and noticed something interesting. I couldn’t find any linkages to foods or hormonal cycles, but I did find one to the timing of my dosage of Klonopin ODT. I experimented with timing when I took the 1 mg dose of Klonopin ODT and shifted that dose to after breakfast. You see, that is when my pain starts to manifest and begin its day’s climb. I had been taking .50 mg then and then saving the additional 1 mg for after lunch. Now I tried taking that 1 mg dose earlier and saving the .50 dose for later in the afternoon if I needed it. After a couple of weeks, I noticed something surprising. Instead of finding a linkage between outside variables and my bad days, I had lucked into a linkage between the timing of my dosage and more good days. I don’t know about you, but I will take that! Will you find something similar in your analysis of your pain diary? I make no guarantee, but I do guarantee that if you will keep one diligently, you will have something concrete to share with your doctor or neurologist at the next appointment, and who knows what helpful information they may glean in it. Ask about a pain diary they may recommend, but be prepared to use it as a template for making your own, more personal version. You won’t use what you don’t like or understand. ← Pain Puzzles – How Long to Solve Them? Thank you for your message about keeping a pain diary. It may play an important role for those of us suffering with our often-dibilitating, rare disease. My maxillofacial/pain specialist advised me to take Gabapentin first thing in the morning; I had been taking the first dose of this mid to late morning when the pain begins its journey to me. I look forward to reading more of your writings. I am so sorry you are dealing with BMS. Gabapentin/Neurontin is a med that has been known to help control the pain of BMS, but recent studies have found even more efficacy with Klonopin/Clonazepam, so keep track of your pain, but know that there are additional therapies you can try if your pain is not under control. Thanks for your comment! Hi Kali, In addition to Gabapentin, I also take Clonazepam. The two drugs keep me sane. Thanks for your response. Bonjour, je souffre aussi du syndrome deBMS depuis deux ans et demi et je suis sous rivotril depuis 9 mois.Je le prends uniquement le soir car j’ai un peu peur des effets secondaires.Je vais etaler mes prises dans la journee, si ca peut m’apporter du soulagement…Merci pour vos conseils. So sorry I do not speak French, but I ran your comment through a translator, and it looks like you have been on Rivotril for 9 months. Rivotril is called Clonazepam/Klonopin here in the U.S. and that is what I take in orally dissolving tablet form. You don’t mention what your dosage is, but if you are taking it at night, you are applying the medicine during the time that we BMS sufferers do not have any pain. It will be much more effective if taken during the day to break the escalation cycle of pain we usually experience. Talk with your Doctor, but I think he or she can put you on a gradual ramping schedule that might allow you to find your tolerance threshold for any drowsiness. I hope this has been helpful!